Makes 4 pint jars. Recipe is by Brenton Day. 1. Cut ends off cucumbers then cut into desired pickle shape (spears or slices). Cut the stems off the chili peppers, then slice lengthwise. 2. Evenly split pickling spice, dill seed, red pepper flakes, garlic and peppers among four jars. 3. Fill tightly with sliced cucumbers, leaving a half-inch of space at top. 4. Bring vinegar and water to a boil, then add sea salt. 5. Fill jars to top with vinegar and water. Tap bottoms of jars on counter to release any air bubbles. 6. Seal jars, allow to cool, then store in refrigerator. Allow one week for flavors to meld together. 7. Keep refrigerated for 30 days or more. Makes 4 pint jars. Recipe is by Teresa B. Day. 1. Wash cucumbers and slice about ⅛-inch thick and place in a large bowl. Slice onion into thin rings and add to cucumbers. 2. Cover the cucumbers and onions with water. Add salt. Let stand for 2 hours. Drain. 3. Sterilize jars in boiling water for 10 minutes. Remove from heat, but leave the jars in the hot water until ready to fill. 4. Place cucumbers and onion in a stock pot or deep Dutch oven. 5. Top with sugar, turmeric, cloves, mustard, celery and coriander seeds. 6. Pour vinegar over cucumbers and onion then bring to a boil. 7. Reduce heat and simmer for 15 to 20 minutes. 8. 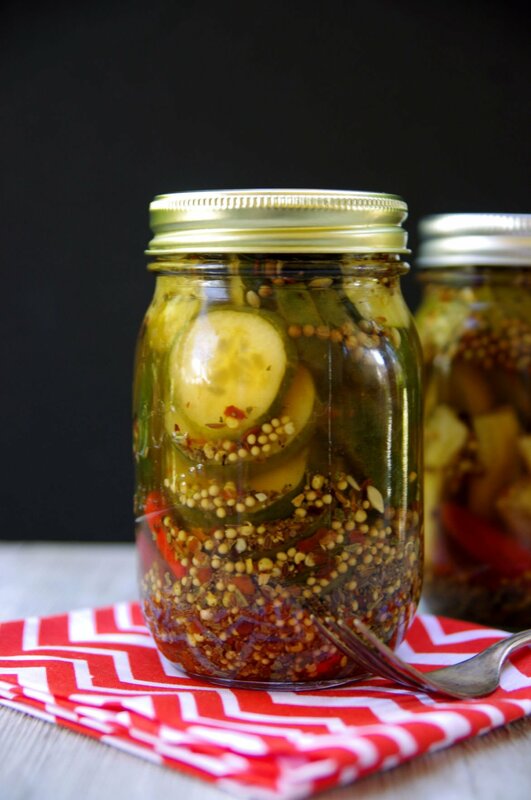 Fill hot jars with pickles and liquid, leaving 1-inch of space at the top of each jar. 9. Return jars to pot of water, bring to a boil and process for 10 minutes. 10. Allow to cool. Pickles can be stored for up to 6 months in pantry.